Rhodonite is a manganese metasilicate mineral, it’s crystal system is triclinic. It occurs most often in massive or granular habits but can also crystallise in tabular form, often with rounded edges. Rhodonite’s name derives from the Greek word meaning ‘rose-red’, and it is usually that colour, though it can also be brownish red. Rhodonite frequently contains black inclusions of manganese oxide. It was once mined in the Russia Ural mountains and is now found in Sweden, Australia, India, Madagascar, Mexico, South Africa, Brazil, Canada and the USA. Rhodonite is said to be able to help one to understand one’s purpose, as revealed by one’s gifts or abilities. If you believe everyone has a skill, gift, or ability then Rhodonite is considered to utilise said such and may help one to value one’s gifts and skills, and to perfect them for the highest good. Physically Rhodonite is said to be an excellent support for weight loss, detoxification and purification of the physical body. Though not a purifier in itself, it may stimulate and strengthen the organ and glands, allowing them to purify the body more effectively. It also said to may help rid the body of gallstones or kidneys stones and may support the healing of the liver from disease or damage. 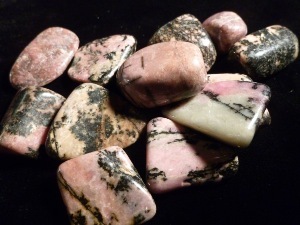 Rhodonite tumbled to a smooth finish, an ideal pocket size stone, small enough to carry around with you. Tumble Stones can also be placed around the home for their energies or can just be nice decorative items. 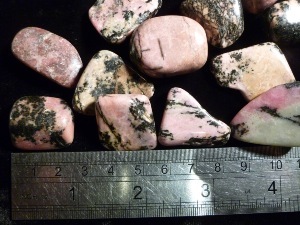 Rhodonite crystal gemstones of varying sizes selected specially for your order.